The title screen of the game. 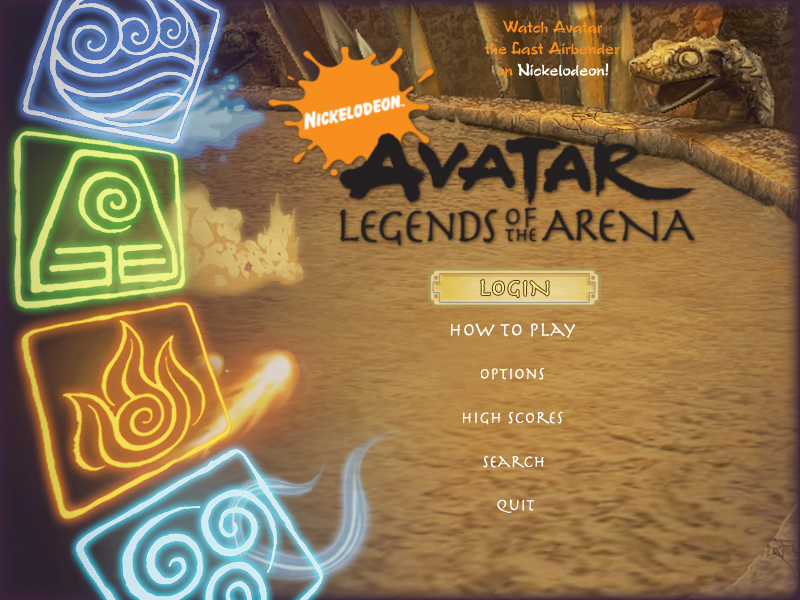 Avatar: Legends of the Arena was a downloadable multiplayer online game based on the Nickelodeon animated series Avatar: The Last Airbender. released on September 15, 2008. Some websites claim that there were also physical releases of Legends of the Arena, published by Digital Eclipse Software and distributed by ValuSoft. 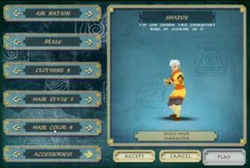 Legends of the Arena was a fighting game where the player could either create their own character (belonging to one of the four nations in the show) or play as one of the canonical characters. Players faced off against three other people, and rounds ended when only one person was left standing, or when five minutes had passed. Winning matches rewarded players with gold, which could be spent on upgrades and equipment. Loading times were supposedly tedious, even for the single-player training mode. Despite there being a complete download of the game available, the game is no longer playable as the game's servers have been shut down a long time ago. ↑ GiantBomb information page on Legends of the Arena. Retrieved 28 Apr '17. ↑ Common Sense Media's review of Legends of the Arena. Retrieved 28 Apr '17.